As the demand for ancillary furniture – and soft seating solutions in general increase, Integra would like our readers to know about their lounge seating product line that brings a flexible, elegant solution to designers. Their design team has thought through many of the details that will make this product appealing to those that review product with function and maintenance in mind, as well as aesthetics. What is the name of the product and some of the key features? The chairs are available in two sizes – designed to fit in any situation. Components are designed to be replaced or recovered so that only the damaged or worn part, (seat, leg, back) can be changed out. Integrated clean-out channel, a concealed channel around the seat balances design with practicality. Arm caps, also available with multiple finishes. How does this product contribute to ‘new ways of working’? 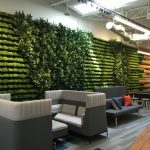 Today’s workplaces are designed with a more open plan, and a variety of spaces to encourage more impromptu meeting spaces, or to work in alternative places throughout the day. This new standard means that designers need more options to place furniture that works in each unique situation. We think the multiple opportunities to tailor the Summit Lounge seating to fit a variety of design schemes that support many work postures. We also believe this product pairs well with our new Kixsy Pull-up Table to provide comfortable and functional furnishings wherever they are placed in the office landscape. We introduced the Summit Lounge series in 2016 and added many options in 2017. The project interior designer was tasked with providing a high-quality, comfortable and durable product line with a high-end aesthetic for a Skybridge area of a project that connects two buildings. The furniture was needed as a replacement option for old, worn furniture. The goal was to provide comfortable lounge seating for use over extended time periods as an alternative work area. Due to the high traffic in this location, facility managers also needed a solution that could be quickly moved around and easily repaired as wear and tear on parts and pieces occurred. The designer conducted user testing on the Skybridge over several weeks, and the Integra Summit Chair was highly reviewed and seen as the most comfortable, flexible option. Dozens of Summit Chairs now are at home in the Skybridge and keep users comfortable and give them many areas to work and socialize. The functional clean-out, the super-cute ottomans, and the options! Two chairs sizes, two swivel options, wood and steel legs, casters, wood, and solid surface arm cap options, coordinating ottomans with matching bases to perfectly fit many applications. Are there any other notable features about the product? The Summit Lounge seating has a Certified Clean Air Gold designation contributing to the better health of the workplace and user. It also has unmatched strength. It has passed a 1000 pound drop test and has a 2000 pound capacity. This feature gives facility managers and designers peace of mind that it will safely and securely hold any user. Also, the clean-out channel detail is a unique feature not commonly found in rounded back chair design. As mentioned above, Summit combined with Integra’s new Kixsy Pull-up Table, is comfortable lounge seating that supports a flexible work and task function, the way people want to work today. We will be showcasing the Summit Lounge series at HCD.18, Phoenix, Nov 11-13.